Are brands out to get us? Could our food, sartorial, satirical and political choices now all be considered as brand alliances? Most importantly, do we secretly really love the idea of being defined in this way? 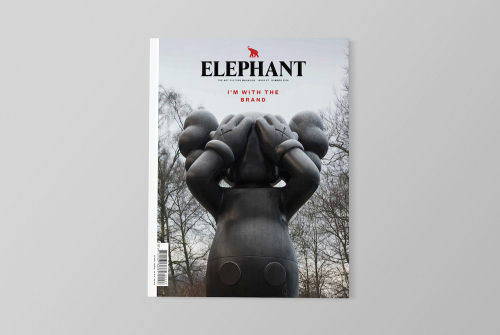 In Issue 27 Elephant investigates the paradoxical relationship that a host of the art world’s new generation of makers have with brands. We meet Chloe Wise, Antonio Roberts, Jemma Egan, Holly White and Rachel Maclean to discuss the changing face of branding and the rise of subliminal messaging. Antonio Roberts doesn’t like being told what to do by big corporations with clever lawyers. A proponent of free culture, the Birmingham-based glitch artist explores notions of ownership and copyright—often by testing the limits of the latter. How is copyright affecting the way that artists are able to create and distribute works that remix or reuse images belonging to other people, particularly brands? I’m not against copyright, I just think it reaches too far. For smaller artists, other people appropriating their work isn’t so much of a problem because if you’re not making much money, you haven’t got much to lose. Whereas for the larger corporations like Disney, they see it as losing them potentially millions and millions of pounds. So I chose Disney for the Transformative Use piece because they have really lobbied to get copyright terms extended in their favour. Read the interview text on the website and pick up a copy of the issue now!